Companies that got into IoT early are reaping rewards in more timely, accurate, detailed, and reliable data. It comes as no surprise that an important part of data analytics is the data itself. 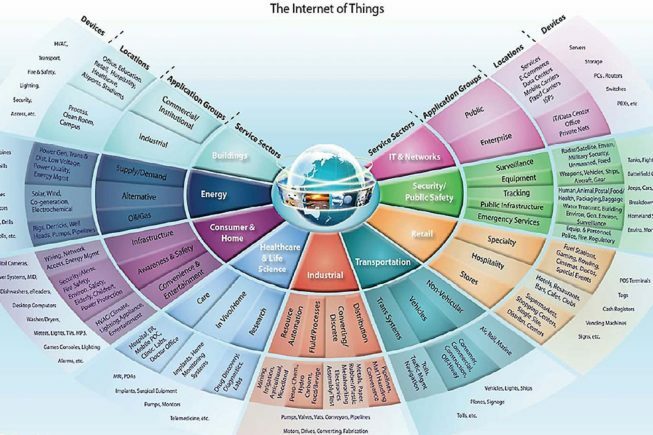 In fact, the appeal of the internet of things (IoT) largely relates to the role of connected devices in gathering this valuable resource. With hyperbole rampant about the new “oil,” “soil,” “coal,” or even “gold,” are we becoming inured to data’s promise? And even if we aren’t, how effective is IoT at delivering on the promise of these data riches? Recently, Stephanie Jernigan, David Kiron, and I researched the effect that IoT is having on organizations. A combination of interview and survey responses from 1,480 managers resulted in a summary report of this research, “Data Sharing and Analytics Drive Success With IoT”. One aspect of our findings that we were unable to cover in the summary report was the relationship between organizational experience with IoT projects and organizational data. Our understanding of this relationship flows from responses to two questions: First, we asked organizations how much experience they had with IoT projects, ranging from none (27%) to actively using IoT for more than 2 years (13%). Second, we asked organizations to assess the data they’ve collected along four dimensions: its timeliness, accuracy, detail, and reliability. Figure 1 summarizes these results. 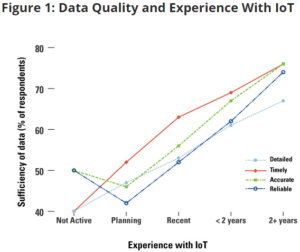 What we found was that increased experience with IoT projects is associated with improvements in the timeliness, detail, accuracy, and reliability of data. This is certainly comforting to those investing the time and resources in deploying these devices. A greater volume of data from IoT devices seems inevitable. But beyond that, organizations improve over time in their ability to get better quality data, not just greater quantities. Of these data quality measures, timeliness exhibits the largest difference. About 40% of respondents whose organizations aren’t active with IoT reported that their data has “mostly” or “completely” sufficient timeliness; in contrast, 76% of respondents who have 2 years or more of IoT experience said their data was sufficiently timely. As systems monitor and transmit data closer to the source, delays associated with data gathering decrease. Accuracy of data takes longer to improve but eventually reaches the same level of sufficiency as the timeliness dimension. How Are Companies Using IoT Now? In this way, IoT can be particularly beneficial in reducing bullwhip effects with projects that “improve supply chain performance to meet variable demand”. While many examples focused on improved speed and efficiency through data, some also spoke of entirely new opportunities that resulted from IoT projects. One respondent noted, for example, that “analytics of the data from IoT is being bundled as a service and is one of the strategies for growth”, while another commented that IoT permitted “developing new modules and linking them with existing products.” Still another commenter described, “testing key biometrics from a small group of employee volunteers to see if there are any specific client interactions [meetings, phone calls, help desk, etc.] with specific clients that create employee stress” – a far cry from industrial equipment monitoring. Perhaps as another indication of the potential for IoT, some respondents were cagey. We got comments such as, “I can’t tell you; it is proprietary!! !” and “we are in stealth mode, so … no comment”. Such comments indicate the potential for competitive advantage that IoT may contain. And yes, there were certainly those who did not provide examples. Some were optimistic that examples will come, with such comments as “… I can only hope”, while others noted that investments were still required (“It really hasn’t borne fruit yet” and “We are in the early stages”) or complementary changes needed (“We aren’t really using it yet; our business model needs changing to make it happen”). It can take considerable effort and investment to get ready for IoT. So while the internet of things is associated with more data, making use of IoT isn’t just about quantity – and fortunately for organizations investing in IoT devices, quality does not seem to suffer in the deluge.